Who knew that one could get such amazing tips and support for natural disaster preparedness at a breastfeeding support group? I almost didn’t go to the La Leche Meeting today- but so glad I did. The meeting was everything I needed today. Some great tips for storm preparation for the breastfeeding family- like what a WaterBob is, collapsible water storage, solar powered generators that won’t run the AC or fridge- but a little something to charge phones, keep a fan going, make a pot of coffee or heat something up on a George foreman/hot plate. Tips for freezing gallons of water and putting them in freezer to save frozen breastmilk. We discussed hacks like the penny on top of the cup of frozen water to determine if breastmilk is safe. We also discussed ways that families that combo feed (using formula and breastmilk) and families that exclusively pump can prepare. Having ready made formula, a way to sterilize bottles, etc. So many real life tips. And then we talked about something else that hit close to home. Redefining what family looks like when you know your kids reality will be different than what you experienced or had planned for them. I always thought my kids would have an Aunt Ryan, and her children would be their cousins- but my sister passed away. So, our children won’t have cousins. They don’t have a great grandmother. And I’ll spare the details, but we don’t have a relationship with my parents- so they have one set of grandparents on Mary’s side and a great grandfather on mine. This looks different than what I had planned. But you know what? My kids are so lucky because we have the most amazing family and support systems- a real village that’s better than I could have ever planned or imagined for them. They have two moms. And a mom that is able to stay home right now while their other mom has a fantastic career that is able to support us and ensure we have everything we need. The have grandparents that live just an hour away. They have an awesome aunt Carey! They have friends that are like family- like their aunt Brandi, aunt Lindsay, aunt Shelby- the list could go on and on. They have amazing great aunts and uncles. 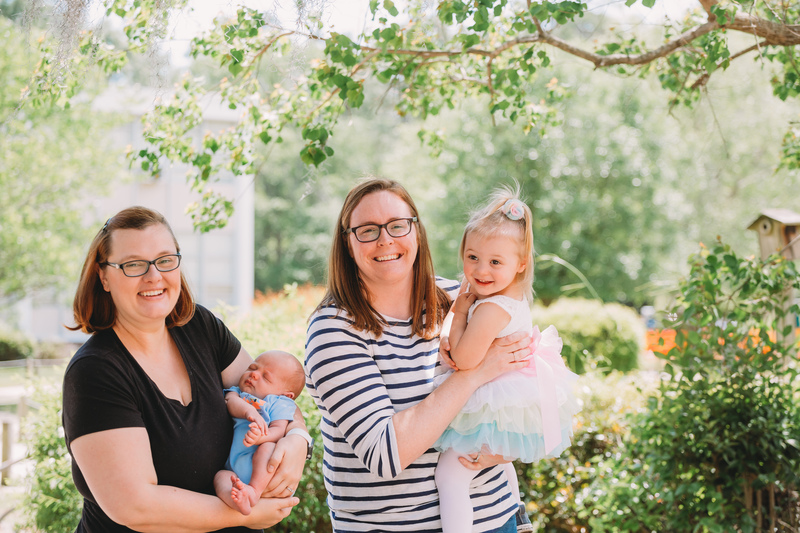 They have amazing adopted grandmothers that I’ve met through all of the breastfeeding support meetings- that give me not only fantastic nursing advice- but also advice for mothering and parenting in a emotionally intelligent, healthy and stable way. So. Our kids don’t have what I had imagined. But that’s just because they were given something better. Growing up- my parents didn’t have strong community ties. They didn’t have a village. When my mother was hospitalized for severe mental illness- there were no meals brought by friends and neighbors. We didn’t have play dates or meet friends at the aquarium. No library story time meet up with friends that are basically like family. But my kids have a different experience. We have so many village Mommas. Village Mommas that bring meals when a baby is born or our toddler is hospitalized. Village Mommas that pass down gently used clothes and toys- just today EJ got 2 American Girl dolls and she LOVES them. Village Mommas that help us learn from their mistakes. That pass down words of wisdom. That reassure us that we are going to be okay. They tell me I’m a good mom. That we are making good decisions for raising our family. That provide our family with a sense of stability and community that I never experienced as a child. And so…the village today gave me some good tips to keep our family safe and fed as the hurricane approaches. If it really does make landfall at a category 4- we won’t be home- we will be visiting my aunt in Virginia most likely. Who knew that one could get such amazing tips and support for natural disaster preparedness at a breastfeeding support group? I’m just so thankful I went today. So thankful for my village. Parenting is hard, it isn’t meant to be done alone. And this journey isn’t what I planned- its better because I’m a part of something bigger. Previous Previous post: But What Did You Do Right? Next Next post: What Did You Hear That Influenced Your Bias?